Do you like 18 Wheeler 3D? Share it with your friends. 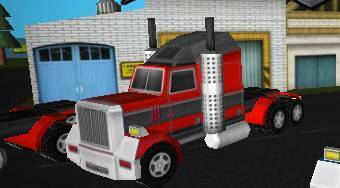 The great racing game 18 Wheeler 3D" with superb 3D graphics will perfectly test your driving skills, while you will be driving an eighteen-wheel towing vehicle. In each of ten levels, the difficulty of which gradually increases, you must park the vehicle on the required spot, which is always marked by a green rectangle.